Taylor Swift is not one to shy away from showing off her really awesome life on social media — and wouldn't you do the same? What's really rad about Swift is that she loves to support fellow musicians and introduce them to her millions of followers who will undoubtedly check out their music — if it's good enough for T. Swift, it's good enough for us. Such was the case when the singer posted a series of Instagram videos that showed her jamming backstage at the Pittsburg stop of her world tour with Little Big Town and Vance Joy. 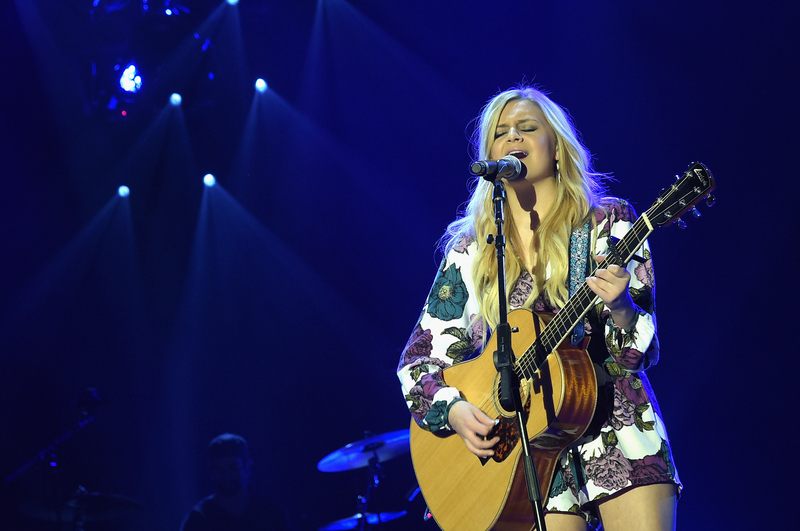 But there was a new face in the mix that was a part of the sing-a-long, too: Kelsea Ballerini. After I saw her videos, I wondered who Kelsea Ballerini was and how this girl got invited to this über cool backstage jam. Swift was super supportive of Ballerini and posted a video of the young artist having a solo moment and performing her song "Yeah Boy" in the middle of the music circle. The girl held her own and Swift even captioned the video, "Petition for 'Yeah Boy' to be @kelseaballerini's next single because it is MY EVERYTHING." So, yeah, Swift is a really big Kelsea Ballerini fan. I looked into some more facts about the talented lady, since she might be the girl to take Swift's country-pop spot while she takes her turn in the pop world. Originally from Knoxville, the 21-year-old took her journals and poems and moved to Music City to pursue her dream — at the same age Swift did! She gushed about Vance Joy on Twitter and now he's opening for her on tour, so I have a feeling this could lead to very good things for Ballerini. Ummm, she was invited to Swift's BFF Abigail Anderson's epic birthday party and looked super cozy with the star-studded guests. Ballerini's first album, The First Time, came out on May 19 and has since been steadily climbing the charts, with her single "Love Me Like You Mean It," hitting the Top 5 on country radio. She is also currently #1 on iTunes country chart in Australia. She cites Clarkson as one of her biggest musical inspirations and told a fan on Twitter that her first concert was Britney Spears' "Oops I Did It Again" Tour and that she has "no regrets." Well, her friendship with Swift could help her out a lot in this area since the "Bad Blood" Singer and Sheeran are BFFs. Ballerini told J-14 , "I would love to do a duet with Gavin Degraw. Or Ed Sheeran. He is so talented. Have you ever seen him in concert? It's amazing. It's literally him and a guitar for an hour and a half, and you're just like, how am I entertained? I am so entertained. He's incredible." Be sure to keep an eye out for Kelsea Ballerini — on Taylor Swift's Instagram and beyond!